I don't know why but making a sponge has always been something that I have been scared of. I think I was told years ago that they were tricky, only people with 'the touch' can make a good one. Perhaps this was something I talked myself into so I didn't have to make one? Whatever the reason, sponge cakes have never been high on my to-do-list, until recently. We made a trip down to Melbourne a month or two ago for a friend's wedding and while we were living it up in one of Melbourne's fabulous cafes having a scrummy breakfast, I couldn't help but be blown away by the fabulous looking sponge cakes on display. They looked so good and so simple I had to at least give the old sponge ago. OK so it has taken me a few weeks, or dare I say months but today I finally had enough eggs in the house for me to have a play. I wanted to make a good one straight off the bat and I new exactly which book to turn too. The PWMU Centenary Cookbook 1904-2004. I didn't want the latest and greatest recipe from the web, no, I wanted a sure winner and if I couldn't trust the women who have made hundreds of sponges in their lifetime then who could I trust? The Presbyterian Women's Missionary Union has been making sponge cakes for decades so I was not about to fiddle with the recipe they supplied. I was a little surprised when I saw the addition of boiling water, so I followed it to the letter. What I ended up with was a very light, airy and delicious sponge. 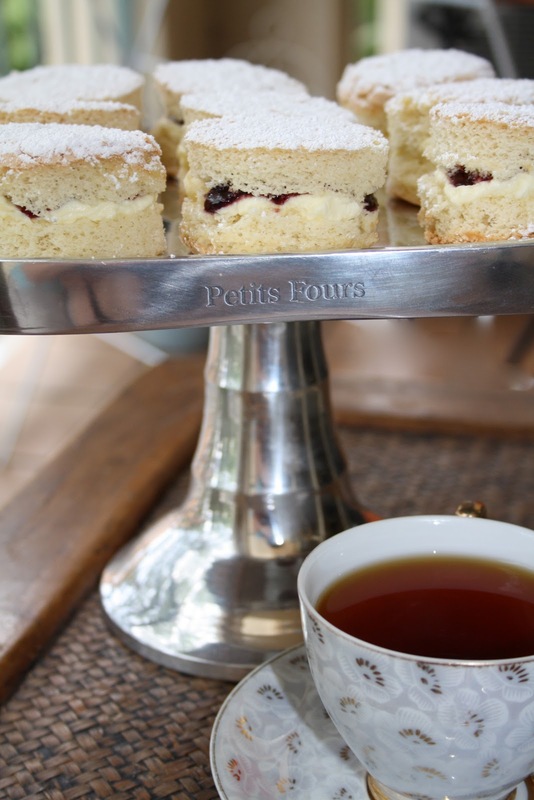 I did it and to my surprise it wasn't a flop thank goodness as I have added mini sponge cakes with berry jam and marscapone cheese to my High Tea sweets list and if I ruined my first attempt it would of been a bit of a soul destroyer to say the least! I made mine in a baking tray because I wanted to experiment with cutter sizes for individual cakes but of course you can also make one fabulous looking whole cake. The only bit of advice I can offer and I think it was something I was once told- just make sure you beat a lot of air into the eggs and use a gentle touch when folding through the flour. Nic being the lovely hubby he is, made a perfect cup of tea so it was mini sponges all round while watching a beautiful sunny day turn into a blackened sky with rain drops. Preheat oven to 180 degree and grease cake tins or one large baking tray then dust with flour and set aside. Add egg whites to a mixing bowl and with an electric beater, beat until whites are thick and creamy. Add sugar and beat until sugar is dissolved, then beat in egg yolks. Fold in sifted flour and lastly the boiling water. Once folded through put into greased tins and bake for 30 minutes. Cool on wire rack then fill with what ever filling you desire! They look fantastic, my we will be very fat after our visit at Christmas time..........because we want to eat sponge cake! Look at your cool blog makeover!!!! I love it! The sponge looks delicious....any babies my way yet? Keep me posted! Looks great! It is always fun to do something new isn't it? The Changes look GREAT!